There's no question that today's healthcare leaders face considerable challenges. There's also no question that many of the top leaders in healthcare are overcoming these challenges and guiding their teams through steady performance improvement in even the toughest healthcare environments. Improving integration across the continuum of care, one of the most important challenges faced by today's health leaders, was the focus of part four in our series from Toronto. 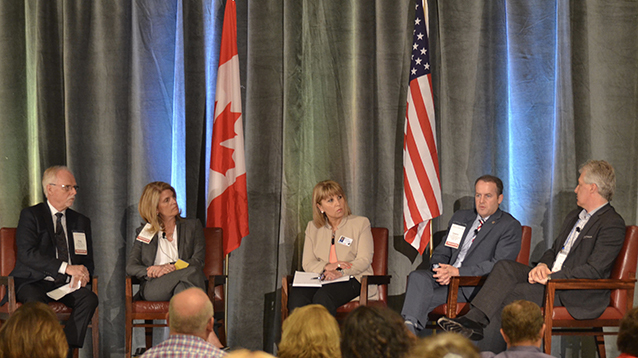 A popular panel session at this year's Toronto conference focused on Hot Topics in Canadian Healthcare. Bonnie Cochrane, director partner development and coach, Studer Group Canada invited four senior executives - Joanne Flewwelling, acting president & CEO, William Osler Health System, Ron Gagnon, president & CEO, Sault Area Hospital, Phillip Griffin, Board of Directors chair, St. Joseph's Health Care London and Cameron Love, EVP & COO, The Ottawa Hospital - to provide a snapshot of current issues including volumes and overcapacity, patient complexity, funding constraints and bureaucratic barriers to change. The panelists also pointed to many opportunities to integrate care, improve services and "do more with less" when leaders can innovate, engage staff, collaborate with partners, develop their teams and focus on patient priorities. Many of the stories told throughout the 2016 conference centred on leadership challenges and opportunities. Bob Murphy, Studer Group speaker, examined these issues through a real-world lens, drawing from his own background in clinical and health leadership and his work with hundreds of partner organizations. He has "looked up all of the definitions of 'leadership' and none of them include the word 'comfort'". The reward, however, is cultural transformation, which was characterized as the "glue that holds all of the tactics together". High-performing organizations demonstrate routinely that, when managed carefully, new practices eventually become organizational norms, and the culture shifts from one where variance is ignored or tolerated to one where disciplined adherence to standards is expected. This experience was reflected in many conference presentations. Eric Hanna of Arnprior Regional Health referred to focusing on the why as "just the way I do it". Cathy Hecimovich of the Central West CCAC noted that if her staff "had an opportunity to return to old ways they wouldn't take it". Michael Heenan of St. Joseph's Health Centre Toronto is already refining the methods his organization will use to maintain Accreditation with Exemplary Status, even though the next Accreditation Survey is three years away. Janice Skot, president & CEO of Royal Victoria Regional Health Centre, described how leadership's focus on "always" has enabled a transformation from an era of quality gaps and low staff morale, to a culture of continuous improvement, disciplined execution and celebration of success. Conference host and keynote speaker Mitch Hagins, general manager, Studer Group Canada, described the elements of the Studer Group approach, and linked many of the ideas discussed. He acknowledged that many of the principles and practices of Evidence-Based Leadership℠ "aren't rocket science, but they are very hard to do". This lies at the heart of the challenge faced by healthcare leaders - taking well-known methods that have been proven effective through literally millions of staff and patient encounters, and applying these with rigor, discipline and consistency, despite inevitable resistance and constant change. The Studer Group coaching model has evolved to respond directly to this leadership challenge. Health leaders may not need another management study or new technology, but they always will benefit from a close and genuine partnership with veteran coaches linked to many other leaders managing the same challenges.